Get the dependability you want! Get the dependability you want and enhance your decor with Rico Stack Chairs. 14” seat height. Sturdy polypropylene seats and backs with a durable steel frame that is protected from scratches and dings by the silver powder-coat paint finish. 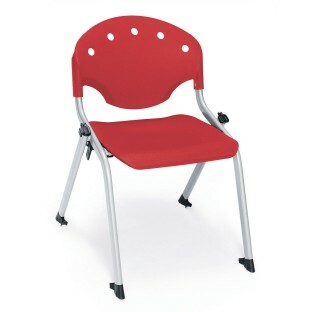 Plus, each chair includes leg protector stacking guards on each leg. Built-in hanging brackets will ease set-up and keep your rows in order. No assembly required. Stacks up to 15 high. Weight capacity is 300 lbs. Greenguard Certified for Children and Schools.